Having a great grilled chicken marinade in your back pocket is essential for summer grilling. 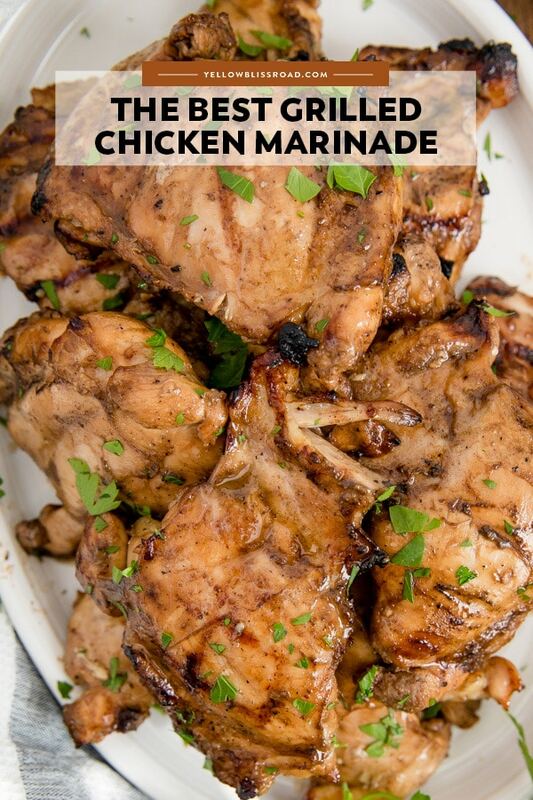 This delicious chicken marinade packs a flavor punch without being overpowering, and it’s great with any kind of chicken, especially these grilled chicken thighs! Food just tastes better when it’s been cooked outside. You can throw just about anything on the grill, from steak and potatoes to veggies and even bread. Grilling season is in full swing and I am always looking for something new to throw on the grill. 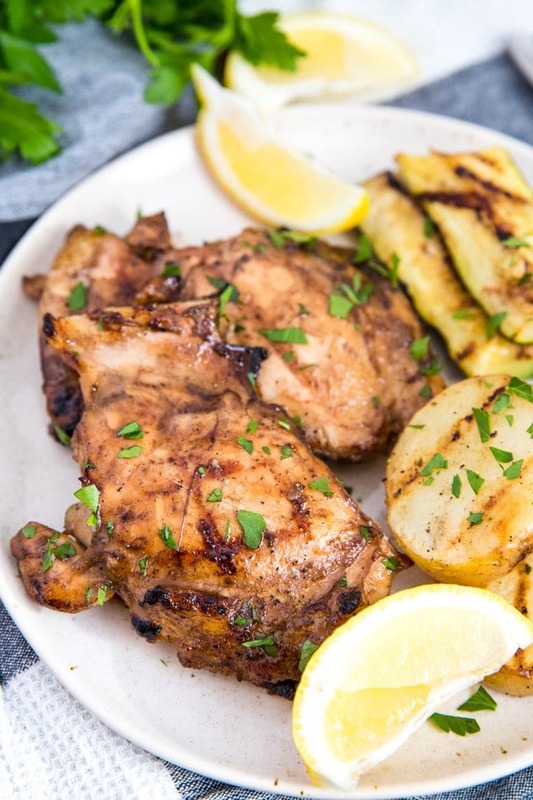 However there are some things that are just meant for the grill and just scream summer, like the perfect Grilled Chicken Marinade. I have tried different flavor combinations for grilling chicken over the years, but this is the one that’s stuck. 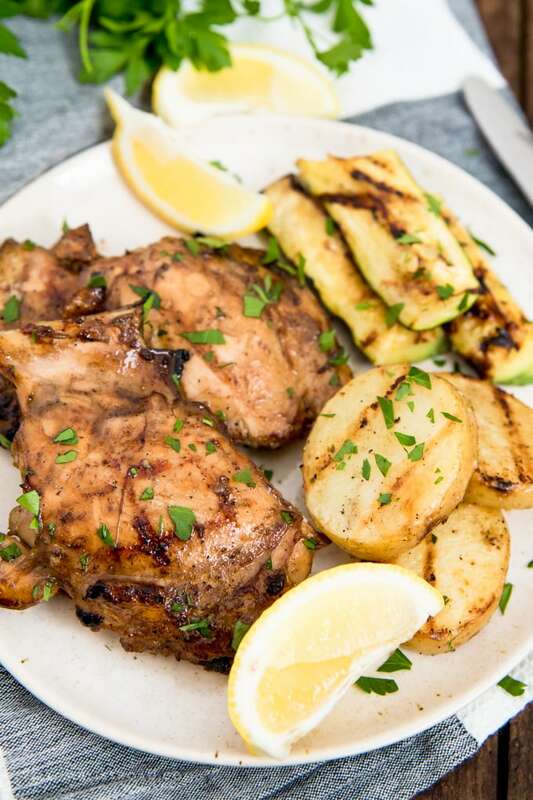 It’s uncomplicated and unpretentious, super simple to whip up and tastes absolutely amazing on grilled chicken thighs, chicken breast, drums…even pork! Salt – salt has flavor, as we all know. Just don’t get too heavy handed with the salt as it can actually dry out the meat. Acid – Acids, like lemon juice, vinegar and mustard, help to tenderize the meat. Leave them on too long though, and they can break down the meats and dry them out, similar to salt. Fat – Fats, like olive oil and canola oil carry flavor and help to infuse the marinade into the meat. Flavor – This may be the most important of all! Add flavor to your grilled chicken marinade with potent, high-flavor ingredients like garlic, herbs and spices to really pack a punch to your chicken. HOW LONG DO YOU MARINATE CHICKEN FOR? Once the marinade is combined, place the chicken in the marinade for at least 1 hour. If you plan to marinate for longer than 2 hours, wait to add the acids (in our case, the lemon juice and balsamic vinegar) until the last 30 minutes or so. PRO TIP: Don not reuse leftover marinade. If you’d like to baste the chicken in the marinade as it cooks (not always necessary, but can add flavor and juiciness), be sure to reserve some of the marinating liquid BEFORE adding the meat. Any marinade that is leftover from the meat should be discarded. HOW LONG DO YOU COOK CHICKEN ON THE GRILL? The answer to this question actually depends on the type of chicken, and the thickness. One thing to remember with any type of chicken is just like a good steak, you want to set the chicken on the grill, then leave it to cook and get those beautiful grill marks. Chicken breasts should register 165 degrees F on a meat thermometer, and chicken thighs and drumsticks should be at 180 degrees. 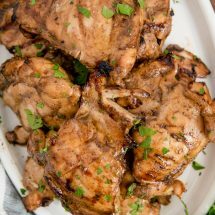 Boneless grilled chicken thighs or breasts take about 4-5 minutes per side. 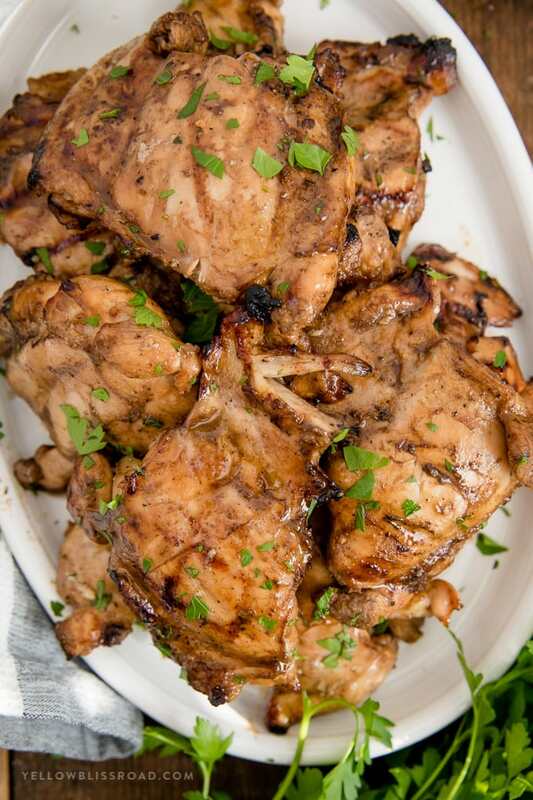 Bone-in grilled chicken thighs or drumsticks take at least double the time as boneless. Watch for flare-ups, and move the chicken off of the direct heat to finish cooking if necessary. PRO TIP: If your grill has a thermometer gauge, use it. You want your grill to be between 350-400 degrees F when closed (and you need to keep it closed when cooking!). Don’t just rely on the knobs for low-medium-high temps. My grill run pretty hot, so those settings are pretty much useless. Looking for a great grilling utensils set? Try this grilling set that includes tongs, a spatula and a basting brush! (aff). WHAT IS A GOOD SIDE DISH FOR CHICKEN? The great thing about chicken is that it is complimented by so many different sides. We love a good Homemade Mac and Cheese or Macaroni Salad. But my favorites side dishes to grill with are things that actually go on the grill with the chicken! Current faves are Grilled Zucchini and Grilled Potatoes. So much flavor! (Recipes coming soon). 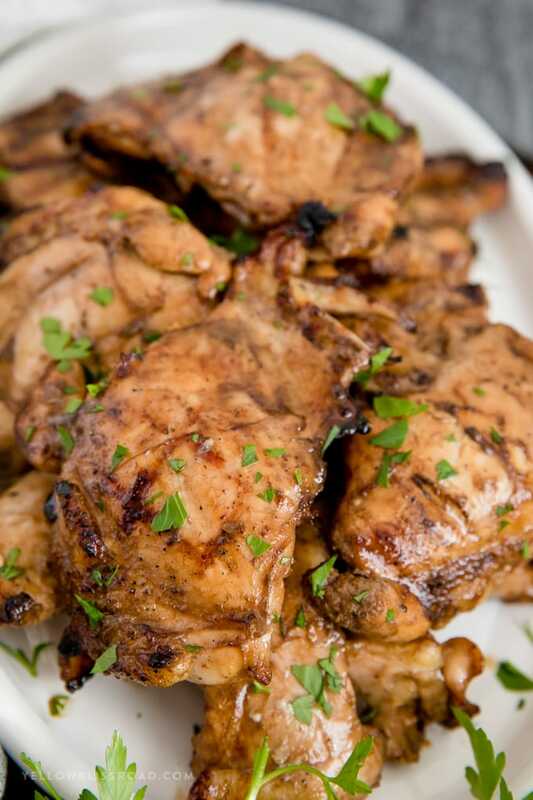 Having a great grilled chicken marinade in your back pocket is essential for summer grilling. This delicious marinade packs a flavor punch without being overpowering, and it's great with any kind of chicken! Combine all ingredients in a large ziploc bag. Press as much air out of the bag as possible when you seal it. *Tip - if using breasts, lightly pound them out to an even thickness for even cooking. Marinate in the refrigerator for at least 1 hour or up to overnight. To cook: Heat grill to medium heat (about 350-400 degrees). Cook chicken for 4-6 minutes per side or until cooked through. Internal temperature should reach 165 degrees F. (Time will depend on the thickness of the chicken). Transfer to a plate and tent with foil. Let chicken rest 5 minutes before serving. If desired, garnish with fresh chopped parsley before serving. That’s awesome Leora! So happy that you and your family loved this recipe! Grilling chicken thighs tonight and this marinade sounds spot on! They’ve been soaking in a brine for a couple of hours, now I am going to throw this yummy marinade together and let those puppies soak it up for a couple of hours! Will pop back in to give my star rating, how it was, if I tweaked it at all, etc. Great marinade! Used on bone-in, skin on chicken thighs. Didn’t have garlic powder so I added 3 fresh minced cloves of garlic. Only had time to marinate a little over an hour in the fridge but turned out awesome! Made this chicken tonight, turned out great!!! Thank you Jene! So glad you enjoyed it! I made these last night and they were delish. I am a cook and they are perfect as is. The marinade took seconds to put together, has the perfect combination of sweet, salt and tang, and does not use too much oil. I grilled boneless, skinless thighs for 6 minutes per side and they were melt in your mouth juicy. I will keep this as my “go to” chicken marinade from now on.